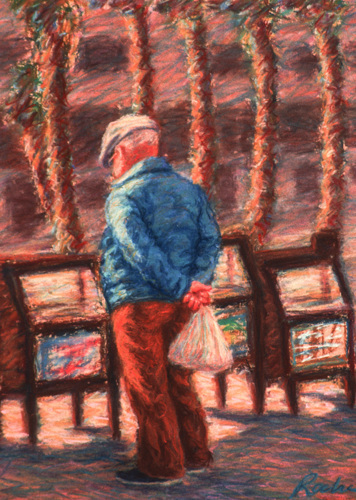 An elderly man reads the front page of the paper at the newspaper rack, but has no intention of buying the paper. The original pastel on paper is in a private collection. This piece is also now available as a limited edition of 50 giclee prints. Framed size is 26"H x 22"W, unframed image size is 18"H x 14"W on a 22"x 18" sheet of heavyweight acid free watercolor paper. Shipping is free. 9.75" x 7"12.5" x 9"